Vintage Green: Photography studio & special Bank Holiday event. Photography studio & special Bank Holiday event. The studio is ready and in use...finally! 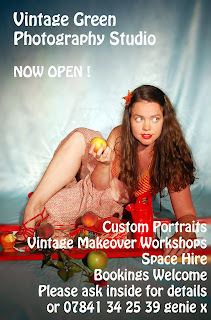 On Sundays in May, we will have our first vintage makeover & portraits workshops, stating on the 20th. We offer you same day portraits, family portraits, high quality portrait photography to capture timeless moments of you and your family in Madison Heights, Detroit MI, Michigan.